The first time beginner scuba diving experience is a half-day charter with two shallow (to 40 feet) introductory boat dives, each at a different Hawaii scuba diving site. There are no study guides or tests to worry about, we will teach you what you need to know with a few quick skill lessons before you enter the water. Beginner Scuba Diving allows participants to dive in Hawaii's open water under direct SCUBA instructor supervision. 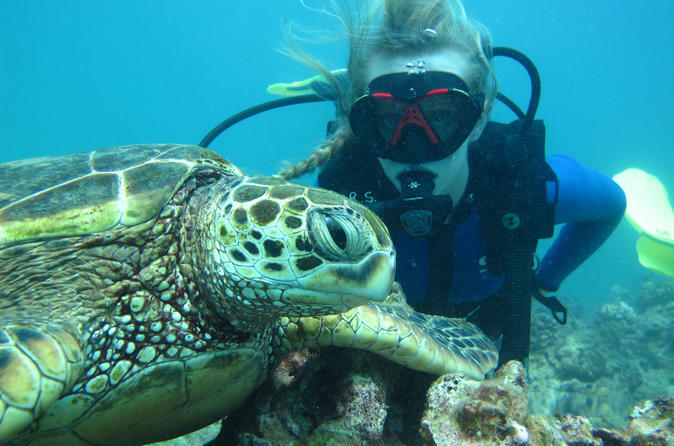 It is designed to encourage scuba diving exploration for beginners and allow people to satisfy their curiosity about Hawaii scuba diving that is both safe and enjoyable. This first time scuba diving experience quickly moves people into the Hawaiian open water environment. After some basic straight forward knowledge and simple skill development sessions, participants scuba dive in small groups at two of our great Hawaii scuba diving sites here in Oahu.